J Bridges Property Maintenance is a friendly reliable business providing home improvement services throughout Hampshire, West Sussex, Dorset and Surrey. Our Services can improve not only the look of your home but the energy efficiency as well. The majority of our customers reach us through recommendations and are happy to recommend us to friends and family. 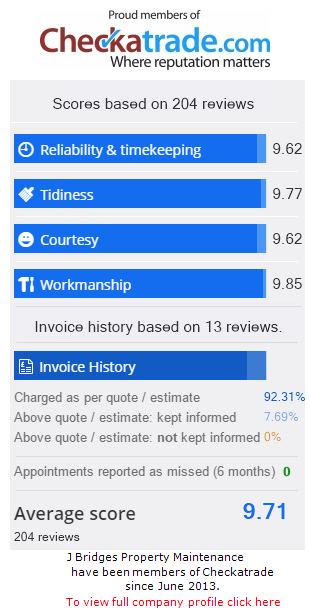 Check out our home improvement testimonials page to see what our customers say about us. With over 25 years of experience in domestic and commercial maintenance from new build homes to superstores we can provide conservatories, complete fitting of double glazed doors and windows or maintaining original double glazing. We replace facias soffits and guttering and also maintain and repair your original external fittings to save you money.. When working on your property we aim to provide you with a professional, friendly service and high quality workmanship combined with competitive pricing and clean and tidy work practices.